Many acres of Brown Cottages in the woods w/picnic area. Fully furnished. 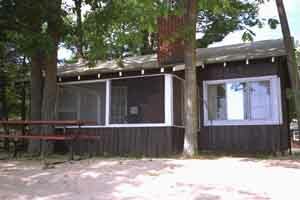 The cottages have 1, 2, or 3 bedrooms, they are finished in pine or cedar and have screened-in porches. Kitchens are completely equipped with gas ranges, electric refrigerators, pans, dishes, toasters, and utensils. Efficiency motel units are also available. While more economical, they are equipped the same as the cottages. They have one bedroom, a kitchen, a living-dining room and stall shower in the bathroom. Cable TV is furnished with basic cable. Bed linens, blankets and pillows are provided. Towels are included with daily rates but are not provide on weekly rates. Enjoy the resort's horseshoe pit, volleyball, basketball, outside fire pits and park-like sandy area. Roast your meals on barbecues or simply relax.